Millennials, also known as Generation Y have had a difficult time leaving the nest. While there are different ranges given for their birth years, they can be roughly defined as those born between the late 1970's and the year 2000. Many define the generation as those that "came of age" around the turn of the millennium. Baby Boomers love to bash them for their work ethic, then ask them for help with technology issues. They are characterized as entitled, self-interested, lazy, and all other manner of negative traits. They grew up in a world increasingly dominated by technology, and later, social networks. ​They also grew up in a time of stagnating wages and out of control higher-education inflation. They were told to "follow their dreams", get a four-year degree, and the house with the white picket fence (or whatever they wanted) would be theirs for the taking. Well, as they have been finding out, "making it" is a little bit more complicated than that, and Millennials are facing serious challenges economically. According to the U.S. Census Bureau and U.S. Bureau of Labor Statistics, the unemployment and underemployment rates for recent college grades are significantly higher than the average for all college grads. Even with the labor market tightening since the Great Recession, many Millennials find themselves working in jobs not related to their degree or in jobs that don't even require one. On top of this, it is well documented that wages over the last few decades in the United States have been rather stagnant and not kept up rising costs of living, especially higher education costs. This has resulted in Millennials earning less than expected and being saddled with ever increasing amounts of student loan debt, which eats up income that would normally be put towards a mortgage payment. 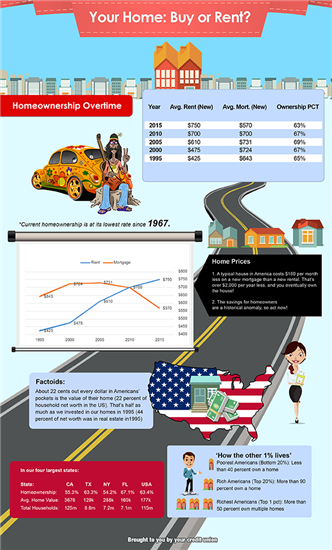 This, coupled with changing cultural norms surrounding marriage has resulted in less young people buying homes. The overall homeownership rate hit a historic low in the 2nd Quarter of 2016 at 62.9%. ​According to the Pew Research Center, in 2014, "...for the first time in more than 130 years, adults ages 18-34 were slightly more likely to be living in their parents' homes than they were to be living with a spouse or partner in their own household". Despite the doom and gloom, Millennials, according to the National Association of Realtors, are now the largest generational cohort of home buyers. According to the Federal Reserve data linked above, it would seem we have finally turned a corner and homeownership is on the rise once again, driven by Millennials. ​Are you a Millennial looking to make the leap to home ownership? Your credit union offers free one-on-one Mortgage Classes so you can learn how to prepare yourself to get approved, or if you are already ready, we can help with that too! ​Just email Amanda at AmandaS@towpathcu.com, or give her a call at 330-664-4708.